Emotional Neglect happens when your parents fail to respond enough to your emotional needs. All children require a certain amount of emotional response and emotional validation from their parents in order to grow up feeling happy, healthy and strong. When your parents notice what you’re feeling, name it, and help you manage it, they are not only teaching you invaluable life skills, they are also giving you some powerful messages. We care about the deepest, most personal, biological part of who you are: your emotions. So if your parents failed to do this for you enough, by definition they emotionally neglected you. And emotional validation is the most important thing you never got. That’s what makes Childhood Emotional Neglect (CEN) so invisible. It’s very hard to see things that fail to happen, and it’s almost impossible to remember them. We have long been aware of the fact that what happens to us in childhood has a tremendous effect upon who we become as adults. But the opposite is also true. What doesn’t happen for us in childhood has an equal, or even greater effect. Emotional Neglect comes in an infinite variety of forms. It can be incredibly subtle, such that a hundred people could be watching it not happen, and be completely unaware. Young Will’s friends gang up on him on the soccer field one day. So Will comes home from school feeling sad. Will’s parents don’t notice his sadness. Neither says, “Will, are you OK?” or “Did anything happen at school today?” No one seems to notice that anything is wrong. This probably seems like nothing. Indeed, it happens in every home, and it usually does no harm. So how could an incident like this damage a child, leaving scars that remain into his adulthood? The answer lies in the natural, developmental needs of children. In order for a child to grow up with a complete and solid sense of himself, who he is, and what he’s capable of, he (or she) must receive enough awareness, understanding, and acceptance of his emotions from his parents. If there is a shortage from the parents in any one of these areas, the child will grow up feeling incomplete, and lacking some of the skills and self-knowledge and self-care that are necessary to fully thrive in this world. And now back to our boy Will, who came home from school feeling sad. If this happens on occasion, it’s no problem. If it happens with enough frequency and depth that what Will feels is not noticed, responded to or validated by his parents, Will is likely to grow up with a hole in his emotional development. He may deeply believe that his feelings are irrelevant, unimportant, or even shameful or unacceptable. As a psychologist, I have seen time and time again that these subtle parental failures in childhood leave the adult with a feeling of being incomplete, empty, unfulfilled, and perhaps even questioning his own purpose and value. These people can’t remember what they didn’t get in their childhoods. So as adults, they blame themselves for whatever is not right in their lives. They have no memory of what went wrong for them, so they have no way of seeing it or overcoming it, to make their lives happier. In addition to self-blame, another unfortunate aspect of Emotional Neglect is that it is self-propagating. Emotionally neglected children grow up with a blind spot when it comes to emotions, their own as well as those of others. When emotionally neglected children become parents themselves, they’re unaware of the emotions of their own children, and they raise their children to have the same blind spots. And so on and so on and so on, through generation after generation. My goal is to make people aware of this subtle but powerful factor. To give everyone the ability to look back and see the invisible, have the words to talk about it, and the opportunity to correct it and stop blaming themselves. I want to make the term Emotional Neglect a household term, so that parents will know how important it is to respond enough to their children’s emotional needs, and understand how to do it. I want to stop this insidious force from sapping peoples’ happiness and connection to others throughout their lives, and to stop the transfer of Emotional Neglect from one generation to another, and another, and another. 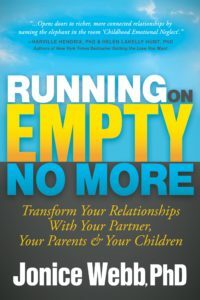 I want to give answers to those many people who are living their lives feeling empty, confused, and blaming themselves, unaware of the key life ingredient that they never got. Unaware that they can now give it to themselves. Since CEN is so subtle and invisible, it can be hard to know if you have it. Take the Childhood Emotional Neglect Test. It’s free. Your emotions are the most deeply personal, biological part of who you are. They are also your greatest resource for coping and strength. Legions of people walk through decades of their lives completely unaware that they are missing something. They may look around, and they may see others living more fully, or with more color or vitality. They may have a vague sense that something is not quite right. But they are intelligent and competent and likable, and so they do okay. They put one foot in front of the other, and they take life step by step. Doing what is expected, and providing what is needed, they have no idea that they’re more vulnerable to life’s challenges than other people are. Until unexpectedly their job changes, or their child has a significant problem, or someone they love moves away or passes away. Maybe it’s a problem in their marriage, or a rejection or a hurtful action directed at them, but something happens to throw them off their game. Perhaps if you had received enough emotional attention in childhood you would now have access to your emotions in a more vibrant and helpful way. Perhaps if your parents had noticed what you were feeling as a child, you would be noticing that now, yourself. Perhaps if you had been filled with self-knowledge and self-care and self-love as a child, you would have them to rely on now, in your time of need. Growing up in a household where feelings are not addressed enough (Childhood Emotional Neglect, or CEN) takes a remarkable toll on a developing child. Not the least of which is this: It sets the child up to be more prone to depression throughout her lifetime, and to forever blame it on herself. If you grew up without enough emotional validation and response from your parents (CEN), you probably did what most good children do: you automatically pushed your emotions away and walled them off. This may have worked fairly well through your childhood, but now, in your adulthood, you need full and healthy access to your emotions. 1. Your emotions are walled off: Since you pushed them away as a child (to cope in your childhood home), you are now living without access to this rich, motivating, stimulating feed back system. 2. You missed the emotion training course that other people got: You grew up in an Emotion-Free Zone. No one taught you how to identify, express, manage or use your emotions. 3. CEN makes you feel alone in the world: When no one notices what you’re feeling enough as a child, and when the response to your emotional needs is tepid or absent, you learn that you cannot (or should not) rely on others emotionally. 4. You are prone to directing your anger inward: Anger can be an empowering, useful emotion when you know how to use it. If your anger was not accepted when you were a child, and if you were not taught how to use it, you are at risk for turning it against yourself. 5. You are inclined to the feel shame: Growing up with CEN, the powerful message that your emotions either don’t matter or are bad can easily make you feel ashamed for having them. Yet your emotions are wired into you. You can’t not have emotions. The result: shame. And now, after all that bad news, I have some very good news for you. 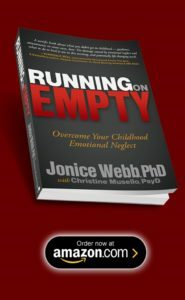 Now that you see and understand the effects of Childhood Emotional Neglect, you can heal it yourself. When you do this, you will not only reduce your susceptibility to depression, you will also improve many other areas of your life as well. • Start working on your CEN. The best thing about CEN is that it can be healed. You can break through that wall that you built to block off your feelings in childhood. You can begin to feel more varied emotions. You can learn how to use your anger in a healthy, protective way. You can learn the emotion skills that you missed. • Accept that your feelings are your friend. Your emotions are a source of vitality and richness. Without them, you are living in a gray world, devoid of the color that others experience. Reclaiming your feelings and learning to use them will connect you, relieve you and enrich you. • Reach out. CEN taught you to circle your wagons, but those wagons are now holding you separate. Learning to let your wagons loosen will open the world to you. With more people on your side of the wall, you will no longer feel so alone. Childhood Emotional Neglect (CEN) is invisible. Yet it makes you struggle with emotions throughout your adult life, and makes you more prone to depression. 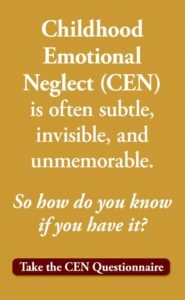 To find out if you are affected by CEN, take the Childhood Emotional Neglect Test.